Some people don't want a rose-colored life. 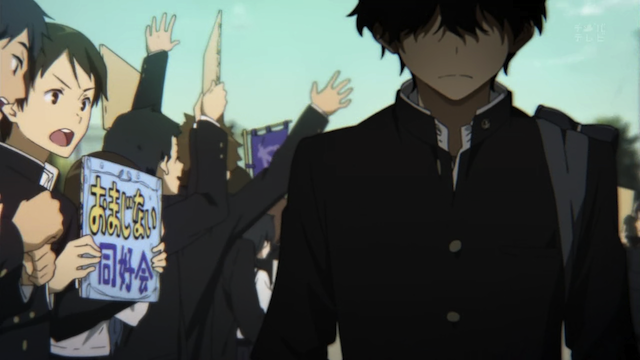 The incredible skill of the animators is evident right from the beginning, as the protagonist, Houtarou Oreki, walks past a crowd of club enthusiasts. Often a scene like this is handled by panning over a still shot. Perhaps there will be minimal animation of the foreground character in front of a still background. 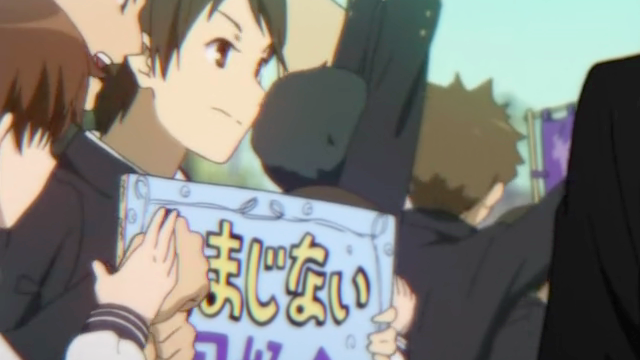 This is because animating crowd scenes is hard and expensive. 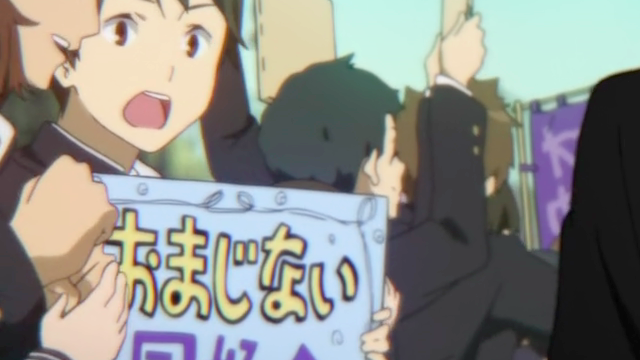 KyoAni goes in the exact opposite direction. 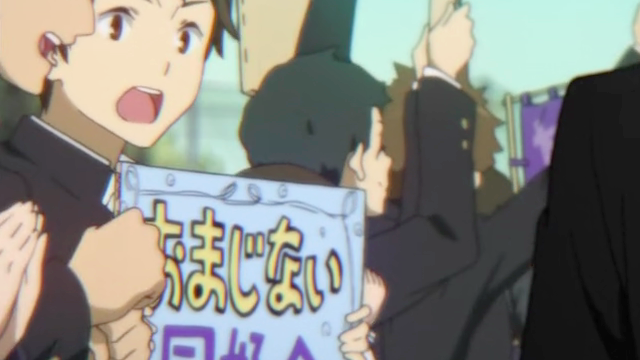 Take a look at the boy holding the signboard. He tries getting Houtarou’s attention, gives up, sees his next mark and directs his energy there. And there is action all around him. This is detailed animation of an irrelevant background character. Why? It turns out that our main character has a philosophy of “conserving energy”. Here the protagonist, normally the subject, is contrasted with the extreme amount of youthful energy shown by everyone else. 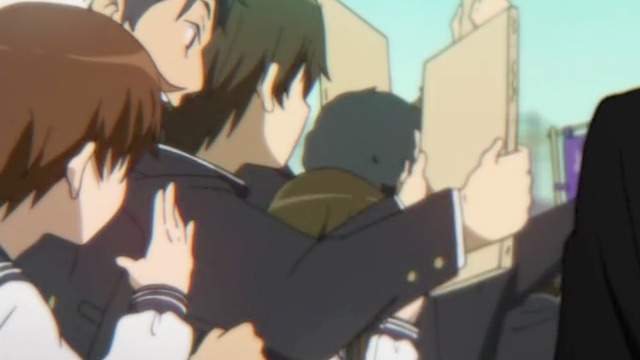 Even background conversations by nameless fellow students are animated with a larger degree of action and realism than many shows put into animations of the main characters. Despite his preference, Houtarou is forced into joining the Classic Literature club. The clubroom itself is another marvel. It is full of all kinds of items and has realistic natural lighting. Houtarou also meets Eru Chitanda there, a girl who has joined the Classical Literature club “for personal reasons”. Eru obviously gets excited by mysteries, and she has a way of entangling Houtarou in her efforts to solve the mystery. Eru Chitanda (left) works her magic on Houtarou Oreki. The central tension of the show (at least so far) is that Houtarou doesn’t want to get involved in anything, but he can’t help but try to satisfy Eru’s curiosity. The first two mysteries in this first episode were on a small scale, but that is to be expected in an opening episode. Honestly the mystery aspect seems more intrinsic to the nature of the series than I was afraid it would turn out to be. Satoshi Fukube. "A joke lasts but for a moment. If it leaves a misunderstanding it becomes a lie." The third character we have been introduced to is Satoshi, who likes to tell embellished stories and poke fun at his friend Houtarou. All three characters were decent. None seemed simplistic or stale stereotypes. I particularly liked Satoshi, though. He seems a real pot-stirrer. Eru is largely a blank slate at this point, but her intense curiosity is endearing. I can’t help but wonder how this one will turn out. For the moment it seems to be another great addition to an already strong season. Due to the whole disillusioned-protagonist-sucked-into-something-by-a-girl premise, I can’t help but be reminded of KyoAni’s greatest work, The Melancholy of Haruhi Suzumiya. Obviously living up to that work is always an incredible challenge, but I still potential for KyoAni to recapture that magic. I’m hopeful that this will be their first good TV series since 2006. 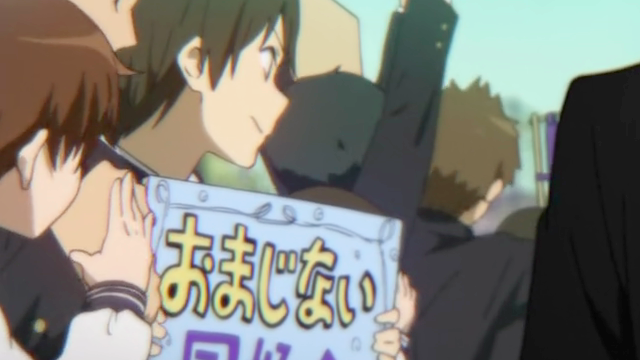 … And the jaded voice-over by the reluctant protagonist in the beginning. There is a resemblance in the basic premise. 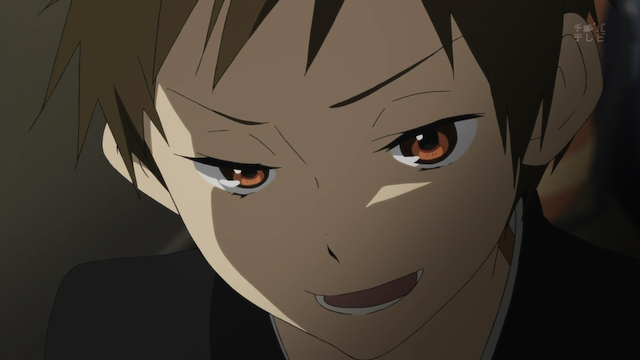 It is also interesting that Haruhi is the series in which they got closest to playing with the Mystery genre. 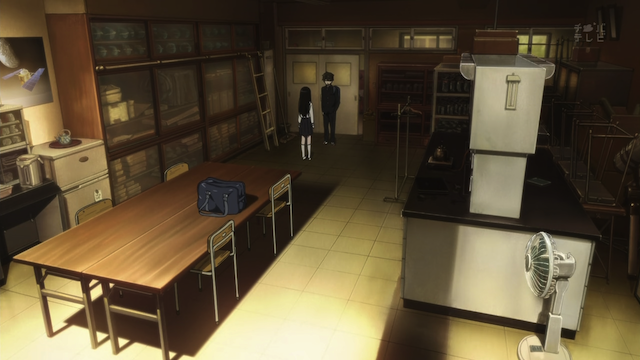 As to Hyouka: One episode is too early to say, but I definitely think they are off to a good start. To be clear, I didn’t really take an opinion on Clannad. I would say that it is an example of the moe shows that KyoAni has been producing, which have caused such a polarized opinion of them in the anime community. Thank you for the review. Watched it. Like it a lot. You’re spot on about how nicely animated this is. I want to see where the mysteries thing goes. I have not been crazy about this anime season (though I like and am following Kuroko no Basket and watching season two of Kimi to Boku, cause I loved season one). But this one might be a keeper for me. We’ll see. I am still mad BLEACH and BEELZEBUB are gone. Still have Sket Dance. 😀 Love me some Switch! 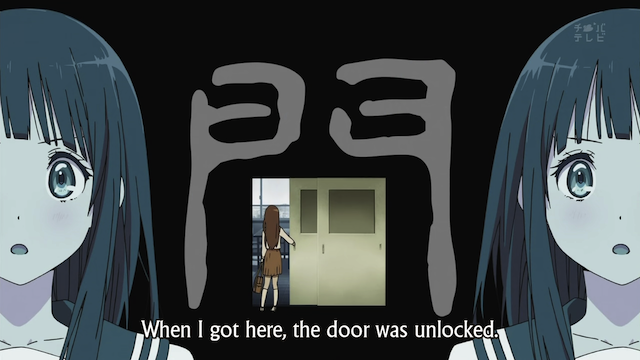 Yeah, I like to see attempts at the Mystery genre in anime, although they don’t always work out well for some reason. 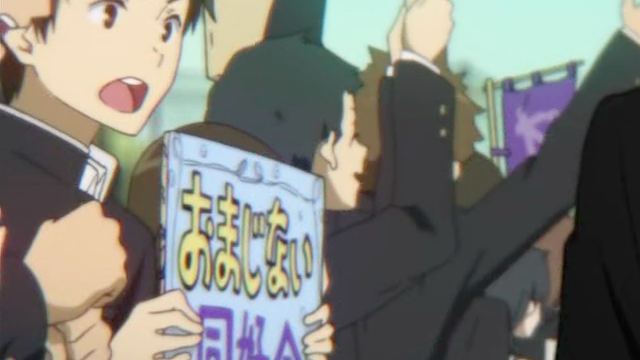 Will Hyouka stick to short mysteries, I wonder, or will the size of the mysteries grow to episode, or multi-episode length? Or will they merely get wrapped up in a mystery that carries them all the way to the end of the season? Kuroko no Basket has some interesting ideas. I’m interested in seeing how they handle this first game to be split across episodes, since I think that is an important component of the Sports genre. I don’t mind episodic mysteries, but I do find that when smaller mysteries all somehow weave into a larger one, it’s just a more fun experience. I did enjoy GOSICK, which had both the smaller mysteries that somehow worked up to the BIG one around Victoria. Oh, and I adored Un-Go–though mostly as it worked in. At first, seemed simplistic. I wonder if we’ll get more of that??? There is supposed to be an Episode 0, but I think that is all the Un-Go we get.